Review – Already Designed by Xavier Neal – 5 Smile Splitting, Romantic Stars!!! 5 Smile Splitting, Romantic Stars!!! When heart throb Levi Stone bumps into Kadence Allan, literally, sparks fly between them, and Levi won’t take no for an answer. Can Levi convince Kadence to take the chance? Or will the Hollywood stereotypical stigma, tear them apart? 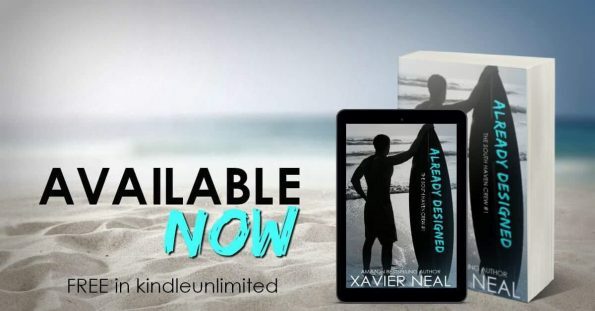 Thank you, Xavier Neal for another epic story. I devoured this book in a matter of hours, I was so engrossed in the story, I lost track of time. Already Designed had me smiling, and laughing, throughout, there is an array of characters and I loved them all in some way, and I can’t wait to read their stories too. This story is full of love, friendship, positivity, and support. They are like one huge family, and I love that. I love how Xavier Neal brings a group of people together and makes them a family, and I love how her characters talk to us the reader, like we are their best friend, right there with them. Levi and Kadence, I loved equally, each has a great sense of humour, that bounces of each other, and they work well together. They are both strong, caring, independent, and not afraid to work for their dreams. They showed us, with their story just how important trust in any relationship, and especially a romantic relationship, really is and that it may take some time, and, we may make mistakes along the way, but if we love hard, fight hard, and learn to listen to each other, trust can be found, and trust can be built up. This story is for all romance lovers, and if you like humour, and loveable characters, Already Designed has it all!